Ericsson has released its Mobility Report for the second quarter of 2017, and some of the statistics are somewhat surprising. Firstly, let’s have a look at mobile subscriptions. 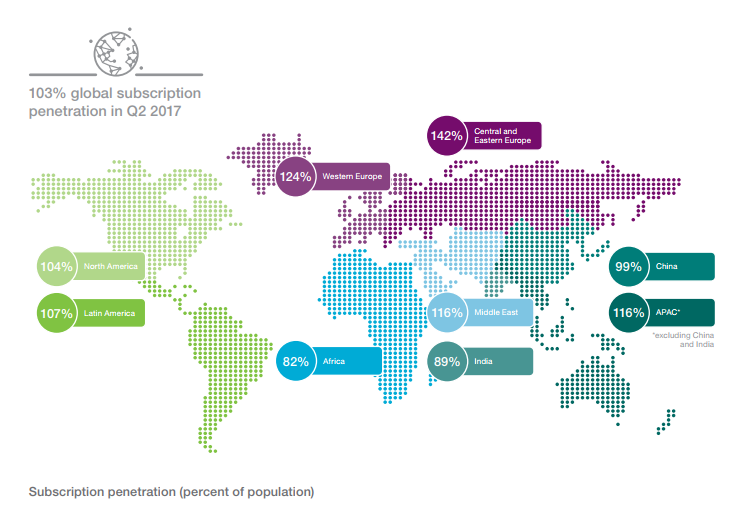 Over the second quarter of 2017, an additional 92 million subscriptions were added to the global total. The number itself is actually growing 6% year-on-year, bringing the total up to 7.7 billion. That’s right, there are more mobile phone subscriptions than there are people on the planet. And there are those who would call today’s generations over-indulgent. 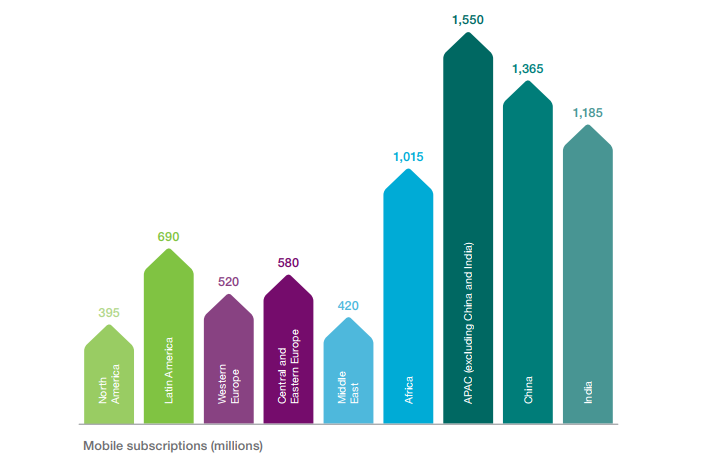 The total number of unique subscriptions around the world currently stands at 5.3 billion, which means that on average, for every person there are 1.45 mobile phone subscriptions. Next time you are sat on the tube, look to your right and then to your left. Statistically, one of those greedy b*stards has two mobile phone subscriptions. We bet it’s the guy who has the shirt with different colour cuffs and collar to the rest of the material. Sitting at the top of the pile, in terms of net additions, is China with 19 million. There will be few surprises there, and perhaps few with the next couple of entries. India, Indonesia, the Philippines and Ghana complete the top five. In fact, when you go back to the total number of subscriptions, there are more in China and India (just over 2.5 billion), than there are in Europe, the Middle East, North America and South America combined. Another interesting area is the room for growth in the smartphone market. Smartphones now account for 56% of the total subscriptions, accounting for 80% of all sales across the most recent quarter. The budget smartphone market is not one which is seen as attractive to the big boys, but if someone could come up with a practical and affordable smartphone which would suit the emerging markets, there is a lot of room to make money. Unfortunately, this is not seen as a viable or attractive business model. In terms of the total amount of traffic which is crossing the networks now, this is another area which has seen a notable uplift. An increase in data just goes without saying, however Ericsson has noted pricing trends in India and the introduction of more favourable data plans, has bumped up the numbers further than expected year-on-year. Sequentially, the total amount of data consumed increased by 10%, though comparing Q2 to the same quarter in 2016, the uplift stands at 67%.